VANCOUVER, BC – Temporal Artisan Ales has announced the release of its latest limited edition barrel-fermented and blended ale. This blend is one of the more interesting and strange beers I’ve put out. The gin barrels arrived with about a liter of gin still in them, which presumably seeped out of the wood during transit. They all had really potent aromas of pine and juniper, with underlying notes of pepper and flower petals. I cast out two different worts to these barrels, and they each received a few different strains of saccharomyces, brettanomyces, and lactobacillus. Tasting the beers as they slowly matured and watching that pine-y juniper note transform into something different in each beer was really fascinating. In barrel #32 there is no longer any juniper to be found, only a distinct chocolate/cocoa puff note. I can’t explain how or why that transformation occurred. Or how in barrel #29 the juniper also disappeared, but the botanical/floral notes became even more prominent. These unique barrels became the backbone for Confluence, and to round them out I chose to blend in a brett-forward beer from one of my bourbon barrels. This contributed sweetness and mouthfeel in the form of vanilla, coconut, and oak. Also lots of musty brett notes. 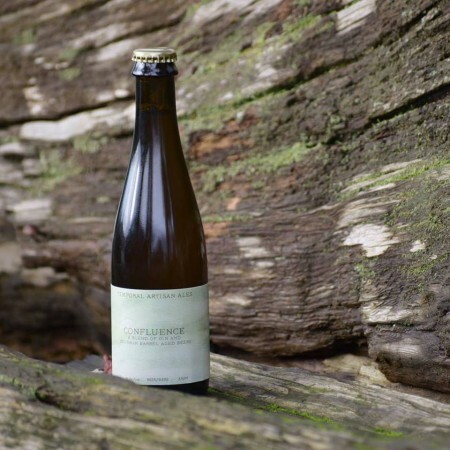 Confluence is available now in 375 ml bottles at Luppolo Brewing, where Stewart works as a brewer, and produces and ages his Temporal beers under a rental arrangement.